TechNote#1: You may or may not have noticed, but the grade of this picket is not mentioned above. That’s because there isn’t one. I’ll explain . 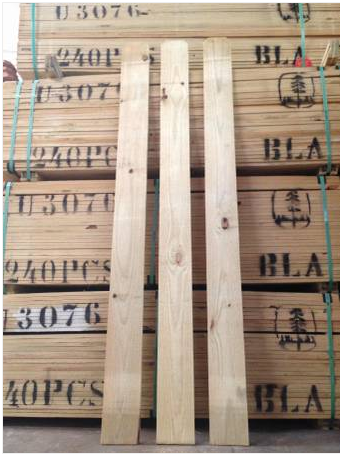 . . Where North American has a universally agreed upon grading system for any lumber product produced by any mill,. . . the Brazilians have no idea what you’re talking about. All they want to know is the dimensions in millimeters of the piece of lumber you want. With that in hand, they go cut down some trees and saw them up into the dimensions you requested. 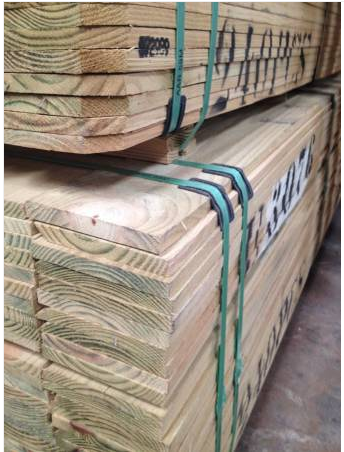 Your lumber is bundled, banded, and loaded into containers and sent to the port. Not very impressive quality control, . . . until you notice that all the stuff that goes into our fencing up here is left lying on the ground down there. TechNote#2: This is exactly the same Brazilian Pine picket that you find in all the big box home centers except for being pressure treated. We catch it (brite) before it’s treated so that it can be stained whatever color you want. The oxidized copper in the pressure treatment will add a green ting to whatever color you’re trying to stain the treated wood. This brite pine gives you a result much closer to what you’re expecting than a piece of lumber that is already some color to start with. TechNote#3: For coverage calx: . . . side-by-side style fence uses a theoretical 2.18 pickets per lineal foot of fence (12 inches divided by 5-1/2 inches) . For board-on-board style with a one inch overlap takes about 2.7 pickets per lineal foot. (The formula for calculating coverage of any board-on-board fence is: Boards per lineal foot of fence = 12 / (Actual Board Width in inches – Overlap in inches) Example: 12 inches / ( 5.5 inches – 1 inch ) = 2.67777 or about 2.7 boards per lineal foot of fence. A 1-1/2″ overlap requires 3 boards per lineal foot. TechNote#4: Unit size is 240 pickets. This Brite Pine isn’t extremely heavy as is it’s pressure treated version. Nor is it light like Wester Red Cedar. It’s about in the middle. 2 units is a comfortable load for a half top pickup. A dual axle (3,500 lb per axle) 16 ft. utility trailer is good for 8 bundles.